Globe Motors designs, manufactures, and distributes precision, subfractional horsepower motors and motorized devices throughout the world. For over half a century, since its founding by entrepreneur Max Isaacson, the Globe Motors name has meant turnkey, motion control solutions for valued customers that depend on performance to achieve competitive advantage. Globe Motors application engineers are experienced in reviewing requirements and suggesting one of our standard solutions. When needs are unique, the Globe Motors engineering team works with you to create the optimal design for your project. Motion control assemblies can be designed to increase durability, reduce weight, decrease size, lower cost, or any other requirement based on your design criteria. State-of-the-art coil winding services from subsidiary Electrowind result in higher efficiencies in BLDC motors. tension/compression ranges to 3,000 lbs. Our experienced design and application engineers stand ready to assist you with motion control solutions; and our vertically integrated manufacturing provides the capability needed to deliver prototypes quickly. Globe Motors designs and manufactures precision rotary actuators to meet your specific MIL-spec or industrial requirements. All actuators offered are powered by Globe Motors, long-recognized for performance quality. The rotary actuators listed here are intended only to provide a sampling of the wide range of units that have been designed and manufactured by Globe Motors. Globe Motors manufactures custom-designed axial-flow and centrifugal blowers to meet MIL-spec and industrial requirements. Whether it's a miniature blower for spot cooling of electronic components, or a larger unit with greater air flows for compartment inlet or exhaust venting, Globe can custom design and build the blower that you need. And for reliable, worry-free performance, all blowers offered are powered by quality Globe AC or DC motors. Globe Motors designs and manufactures limited rotation torque motors that provide extensive torque ranges and rotation rates to handle your most demanding appliation. The generators shown are typical designs available on standard orders. 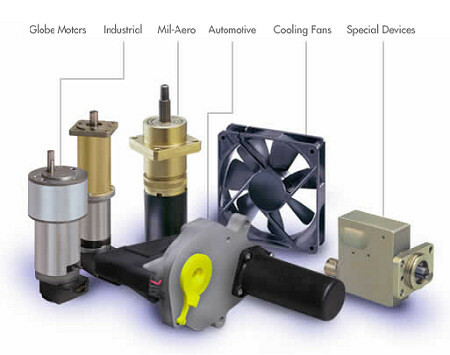 Globe Motors' extensive experience in manufacturing precision miniature electric motors and motor-driven devices makes it possible to design and produce generators with the extra characteristics to suit each application. Type LC and YC generators are built to meet MIL-G-5413. Type UC is built to meet MIL-G-26611. In addition to these special configurations, Globe Motors produces AC generators in basic sizes similar to Type SC and Type MC AC motors. Please consult Globe Motors for further information or send complete application data for a quotation or engineering recommendation.